In late 2014, 11-year-old Manny Ochoa (not his real last name) walked away from a fight. He was wearing a blue shirt, which, in Salinas, can be a sign of gang affiliation. A kid dressed in red challenged him with a curse. A year earlier, the outcome might have been different. Manny used to get into lots of fights, at school and on the streets. But his mindset has changed since he started attending a Wednesday night mentoring program called STEP UP, run by Partners for Peace, a 24-year-old nonprofit working to prevent violence and build a more peaceful Salinas. Manny has seen things that 11-year-olds shouldn’t have to see, watched people get beaten for wearing the wrong colors. His 21-year-old brother, a gang member, was sent to prison for attempted murder. His divorced parents work long hours in the fields and doing construction. Victor Perez, center, and mentor Anna Camberos smile as the next round of the the “Titanic” friendship game is called out at the Silver Star Resource Center in Salinas. These experiences, common to many children and teenagers in Salinas, increase the risk of kids cutting classes, dropping out of school and getting involved with gangs and crime. Truancy, often the first contact that kids have with the justice system, rose in Monterey County schools during the 2012-2013 school year to 18.3 percent, up from 16.3 percent the year before. Still, that is lower than the state average, thanks in part to concerted efforts by the county to prevent truancy. A key part of those efforts is the Silver Star Resource Center, a kind of one-stop assistance center where social workers, mental health counselors and education specialists from multiple agencies offer help to Salinas youth who are teetering on the edge. Last year, Manny’s mother began to worry that he might be such a kid, might be headed in the same direction as his brother. So on a Wednesday night in early 2014, she brought him to Silver Star to meet Leo Jimenez, a Salinas man who spends his days as a substance abuse counselor at Soledad prison and, on Wednesday evenings, runs STEP UP. The mentoring program aims to helps kids, age 11 to 15, whose exposure to violence, trauma and the negative influence of siblings or friends puts them at risk for gang or criminal involvement. In the past, the mentoring program run by Partners for Peace targeted older kids. But when the program reopened in 2013 after a two-year hiatus, with Jimenez at the helm, he decided it was important to reach younger kids. 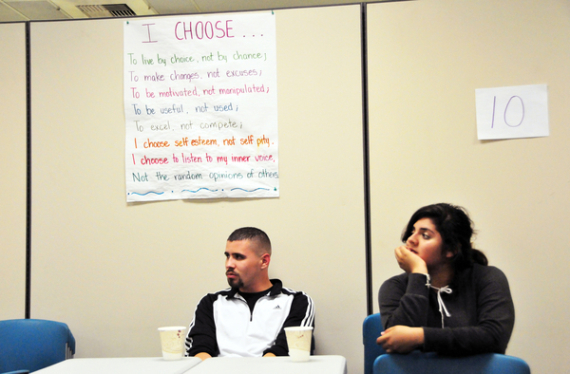 At the Silver Star Resource Center in Salinas, mentors Jose Coronado and Ariana Lopes listen to Leo Jimenez underneath a sign stating the group’s pledge. When Jimenez met Manny, “he was impulsive, failing some of his classes, rebellious with his teachers and acting like his brother,” Jimenez says. At first he resisted coming but the chance to safely hang out with other kids while eating hamburgers and hot dogs quickly wore down his resistance. Soon, Manny was opening up to the group and especially to Jimenez, who grew up in East Salinas and knows its streets and culture. Jimenez and Ana Camberos, a coordinator and mentor, led group discussions on issues like violence, cyber-bullying, sexual harassment and the influence of social media. They talked about goal-setting, organized field trips to San Jose’s tech museum and San Francisco Giants games, took a boat trip on Monterey Bay. Jimenez would share stories from his day job—working with Latino inmates in prison—to get the kids thinking about the implications of their choices. For Manny, those stories connected. 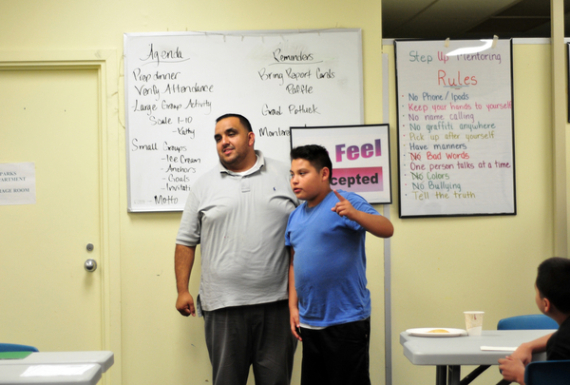 Mentor Leo Jimenez and Manny Morfin participate in a confidence exercise at the Silver Star Resource Center in Salinas. Little by little, Jimenez got Manny to start thinking about his short-term and long-term goals. He decided he wants to graduate from high school—something his brother didn’t do—and go to college. More immediately, he wants to play Pop Warner football and to do that, he had to raise his grades. Nine months after starting at STEP UP, Manny is passing all his classes, plays safety and linebacker on a football team and looks forward to coming to the group on Wednesday nights. He’s learned a lot, he says, like “how to solve my problems without violence and fights.” He plans to rejoin the program in February after it resumes from its three-month winter holiday. For more information about Partners for Peace, visit www.partners4peace.org.